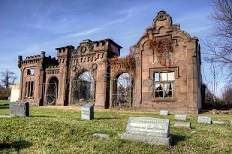 In December 2014, DJS donated its resources and time to digitally preserve a historical Philadelphia landmark, the Mount Moriah Cemetery Gatehouse. Designed by architect Stephen Decatur Button in 1855, the Gatehouse has suffered from decades of extreme neglect by its previous owners. The Gatehouse is in rapid deterioration, and experienced a major wall collapse as recently as August 2014. 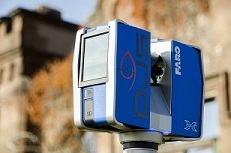 DJS Associates collected 3D laser scan measurement data of the Gatehouse as it currently stands, in the hopes that the measurement data will aid in moving forward with immediate restoration needs. The Friends of Mount Moriah Cemetery are actively seeking funding to stabilize the facade of this historic and symbolic representation of the cemetery so that a columbarium for remains can be built in the future. We sincerely hope that this important Philadelphia landmark can be saved, so that it can be enjoyed and admired by future generations.